The EverBlock System was designed to allow you to build nearly anything. Reflect your individuality and build amazing things with our modular system of over-sized plastic building blocks. Building is fun and takes mere minutes. It is also quick and simple to take apart and reassemble into hundreds of other objects, structures and designs. EverBlock comes in three block sizes; Full Block, Half Block, Quarter Block and a Finishing Cap that interlocks to create a flat smooth top surface. These varying block sizes allow for an unlimited building potential and designs. Winter in NYC is a truly magical time. The stores fill their windows with holiday displays and the streets are strung with bright lights. People shuffle around with smiles and scarves anticipating what each city block and park has to offer. NYC never disappoints and this year was no different. 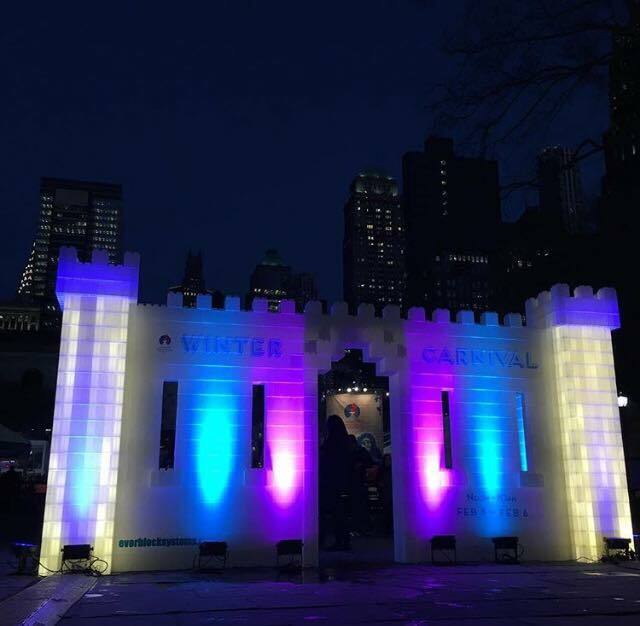 From January 27th to February 4th EverBlock Systems worked with Bryant Park and Bank Of America to build the 2nd annual “ice” castle for their Winter Carnival. 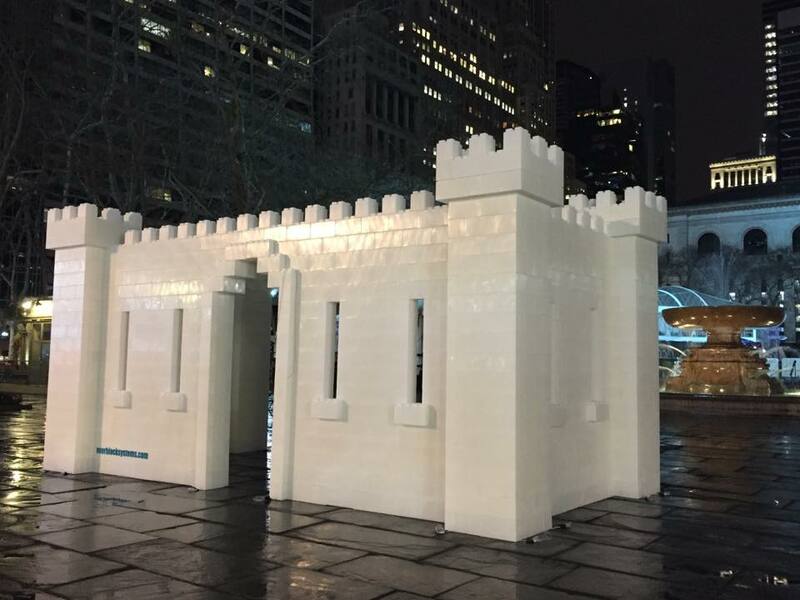 This was the 3rd annual Winter Carnival event that Bryant Park held, and EverBlock’s 2nd year building an urban interpretation of an “ice” castle… This year’s castle was even bigger and better than last year. It all started in our 3D Builder, where our designers worked layer by layer to design the 10ft castle with our modular building blocks. From there we had a rendering to work off of while we built and staged the castle (no tools required). Over 1,800 blocks were used to create the “ice” castle and arches and it took roughly 6 hours to build. People walking by couldn’t help but stop and ask what the end result would look like; some even pulled up chairs with hot chocolate in hand and watched block by block as the”ice” castle came together. The Bryant Park Winter Carnival was filled with winter village tents offering hot food and beverages. For nine days NYC natives and visitors alike filled the park to ice skate, listen to music and warm up in the lodge. There was even a special ice skating showcase starring Olympian, Johnny Weir. Come nightfall the castle was lit by colorful dramatic uplighting which made for the perfect scene for selfie central. 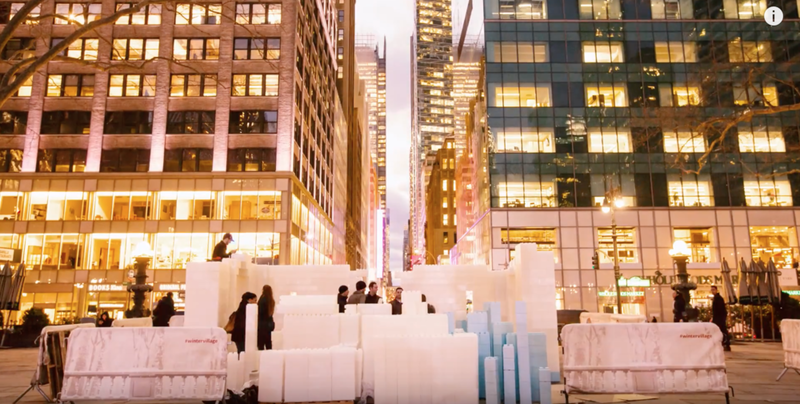 Check out the fun time-lapse video of the “ice” castle being built from start to finish, and be sure to visit Bryant Park next year for their 4th annual Winter Carnival with Bank Of America. We are planning a huge build that will give you ‘chills’. EverBlock Systems offers reusable modular building blocks that can be used to build objects for all types of unique applications. From decor at events, structures for disaster relief, architectural elements and accents, furniture, props, trade show displays and so much more EverBlock modules make the perfect system for all types of creations and design ideas… You are limited only by your imagination. Visit the EverBlock website and let’s build something incredible together. Renowned LA based photographer, Andrew George, brought his stunning "Right, before I die," an exhibition of portraits and testimonies of twenty palliative care patients, from its stay at the Musea Brugge in Belgium to San Francisco for its US premier. Grace's grandeur, gothic architecture was the perfect setting for the contemporary, yet timeless work of art. 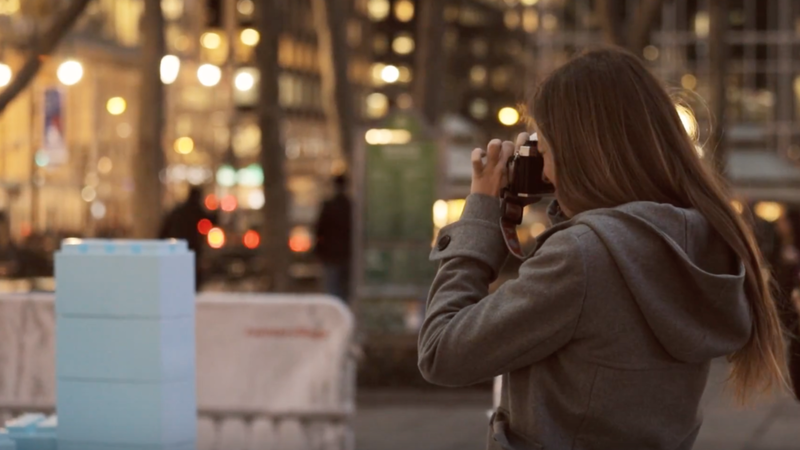 EverBlock served as the story wall for this full scale installation. Over 2200 black blocks compiled the 120 foot long, 9 foot high wall. Abbey Party Rents SF installed the wall with a just a few team members in under 4 hours. The portraits and writings were mounted to the blocks and lighting was attached above to highlight each story. The solidity and sturdiness of the EverBlock wall was a good match for the gravity and solemness of the subject matter of the artwork. The monochromatic black offered a clean and elegant backdrop, allowing the art to be the centerpiece. "Right, before I die" is currently on display at Grace Cathedral through August 10th and is free to the public. Its next residence will be at the Museum of Tolerance in Los Angeles, where the monumental work will adorn another EverBlock wall built into a brand new design. EverBlock is honored to have been a part of such a profound and moving installation at Grace Cathedral. Learn more about Andrew George and the RBID project HERE.